A sweet and salty flavors favorite! In a medium microwave-safe bowl, add white baking chocolate (or almond bark) and melt as indicated on package. Stir cinnamon and nutmeg (optional) into melted chocolate and stir until smooth. Begin dipping potato chips in mixture until they are about half submerged. Shake off any excess melted chocolate and place dipped chips on to wax paper-lined baking sheets to cool. 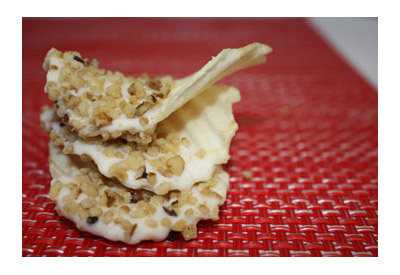 Sprinkle dipped chips generously with chopped walnuts or coconut (optional). Enjoy or gift this mouth-watering treat!